For the first time since a very long time Palestinians from both sides of the Green Line came together, breaking the fragmentation imposed on them by Israeli apartheid. Palestinians from Haifa, Yaffa, the Galilee and the so-called Triangle met with Palestinians from Jerusalem, Bethlehem, Nablus, Hebron and Jenin. 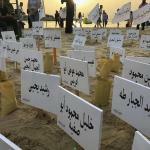 People marched together to the sea shore where the names of the martyrs have been displayed in the sand and candles were lit. The participants remembered the massacres since the start of the Nakba until the latest killing of over 110 people during the #GreatReturnMarch, sending video messages to Gaza. "For activists and people from both sides, this was an important and inspirational moment. 70 years after the ongoing Nakba started, we are still one people with one aspiration: justice. For Palestinians, the memory of the past is at the same time mourning about the present massacres and a reconfirmation of our commitment to our struggle for life - a life of dignity, freedom and justice. We will never give up the hope, indeed the conviction, that united we will overcome Israeli apartheid and occupation, ensure the right of return for our refugees and build a future of human rights for all." Tantoura has bee victim of one of the most heinous massacres during the Nakba. The village was raided on May 1948, by the Hagana militia of the newly founded state of Israel as part of the operation code-named ‘Coastal clearing’. The militia forced 70 people to dig their own graves and executed them. The entire remaining population of 1700 people was expelled. Today only a shrine, a fortress, an ancient well, and a few of the houses remain, abandoned. Nahsholim and Dor settlements were built on the land at the outskirts of Tantoura. The activity organized by the movement ‘Falastiniat’ formed by Palestinian citizens of Israel and Stop the Wall Campaign.